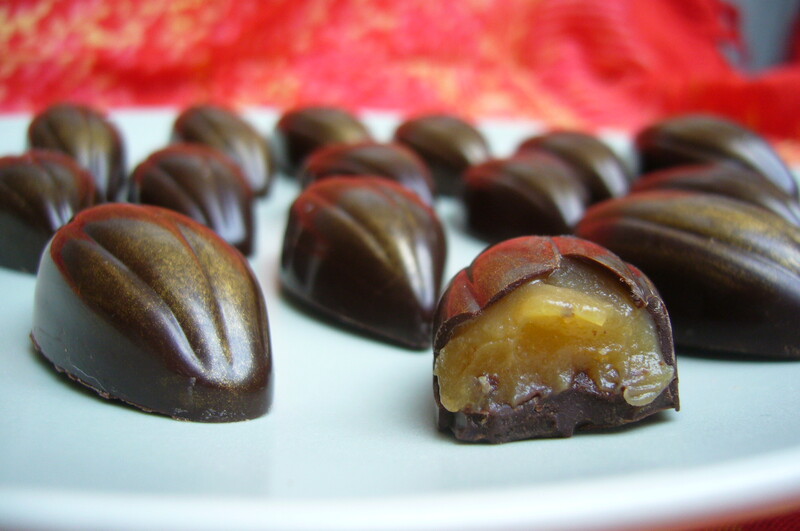 I have been building up to making these – I’ve been a little terrified because of what happened a few years ago when I last made caramel. Silly me tried to get every last yummy morsel off the wooden spoon and a blob flicked out of the 250°C mass, landing on my thumb. I felt faint, panicked and rushed to the cold water tap. It wasn’t pretty. I’m left with a large trophy scar to remind me to be careful when cooking with sugars! Anyway, having finally got over that trauma, I decided the time had come to try again. Sea-salted caramels it was to be. I know they’re becoming just slightly ubiquitous but they are super yummy, and something every good chocolatier should know how to make. These got the seal of approval from my good friend Anna, who until last night had not eaten chocolate for 10 years and 5 months. She decided to break her long chocolate fast with one of my creations, a special moment. I was truly honoured. It was worth the wait, they were delicious. Congratulations you’re doing great – so many different techniques to learn, i cannot wait for my next tasting. These were delicious! The flavours complemented each other really well without overtaking. Despite the very minor thickness/thinness issue, these are going to be a big hit!